While hanging out at a crossing near Ann Pere we had some time to kill. 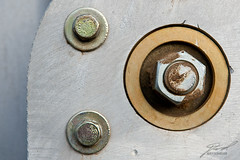 I've always enjoyed the nutz and bolts on the crossing arms. This was another opportunity to grab photos of some.